Meet Ethan Albright, the lowest-ranked player in "Madden NFL"
Ethan Albright is good at his job. Very good. 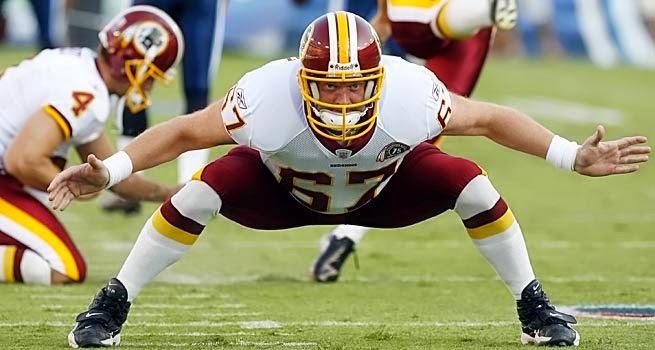 In fact, the Washington Redskins' long snapper is probably better at what he does -- blindly hurling a ball between his legs, under extreme duress, with zero margin for error -- than most of us will ever be at anything. Of course, you'd never know this from playing "Madden NFL 07." Within the pixilated world of the popular NFL video game, Albright isn't merely another anonymous special teamer. No such luck. According to the game's Byzantine individual skill ratings -- which measure everything from foot speed to spin-move ability to a player's effect on team morale -- he's the hands-down, rock-bottom worst player in the NFL. Worse than first-round draft picks and underperformers J.P. Losman and Mike Williams. Worse than retreads Gus Frerotte and Antowain Smith. Worse than that He Hate Me guy from the XFL. Never mind that Albright is a 12-year veteran earning nearly $1 million per season, a player whose quiet, consistent excellence gives Washington coach Joe Gibbs one less reason to lose his hair. To the citizens of Xbox Nation, he's less useful than dryer lint, the dude with the overall player rating of 53 on a 100-point scale. "Honestly, I don't know what to say about the Madden ratings," Albright says with a laugh. "Some guys are into it. I'm not. Doesn't register with me at all. Rate me whatever, I don't care." "Did they rank all the players in the league, all the other long snappers?" They did. Even the long snappers. Even Seattle defensive back and 2000 NFL draft Mr. Irrelevant Michael Green, whose 83 rating is 30 points better than Albright's. Oy. "That's not fair," says Redskins offensive tackle Chris Samuels. "There's a lot of other long snappers out there, and Ethan's better than those guys." While Albright's relative indifference to "Madden" is understandable -- a 35-year-old father of four young children, he's more familiar with "Super Mario Brothers" -- it's also increasingly rare. By and large, today's pros grew up with the game, now in its 17th annual edition. Many players, such as Donovan McNabb and current cover boy Shaun Alexander, aren't just featured in "Madden" -- they play "Madden" on road trips and in locker rooms. And they care about how their virtual incarnations measure up. Care quite a bit, actually. "It's not enough to be in the game," says Sandy Sandoval, a pro athlete rep at EA Sports, the company that makes "Madden." "They all want to be rated at 99, even the rookies. It's a pride thing. Every time I walk into a locker room or see players, somebody is not happy with their ratings. They blame me." Sandoval doesn't actually rate players, a job that falls to EA Tiburon, the Florida-based software studio that makes the game. No matter. In NFL circles, he's the face of the Madden franchise. Which means he hears a whole lot of carping. Clinton Portis thinks he should be stronger. Willis McGahee can't fathom why he isn't quicker. Edgerrin James wants to know what Portis and McGahee are rated, and how he compares to his fellow University of Miami alums. The league is akin to Lake Wobegon; everyone fancies himself above average. It's a pride thing. Of all the pros to pester Sandoval at television commercial shoots and promotional appearances, two stand out: Daunte Culpepper and Byron Leftwich. At a quarterback challenge event a few years back, the latter badgered Sandoval like a little kid on a too-long car trip. How can Carson Palmer be faster than me? Dude, how can Carson Palmer be faster than ME? "I damn near had them do a run-off right there," Sandoval recalls with a chuckle. "Years ago, Emmitt Smith was coming off a great year, and he was almost unstoppable in the game. But he complained that he was too fast, too good. He's the only guy I've ever heard say that." Donny Moore concurs. The "Madden" ratings guru at EA Tiburon, Moore judges his work by a simple standard: players pleased with their ratings are probably overrated. To come up with "Madden's" numbers -- approximately 225 variables per player, including uniform equipment -- Moore talks to scouts, sifts through statistics and watches "about 90 percent of every NFL game." Ratings are relative, with players at the extremes (Randy Moss for maximum speed, Terrell Owens for minimum team morale) setting the standards for everyone else. The process, Moore admits, is as much an art as a science. "This year, we added a spin-move rating," he says. "Well, you'd be hard-pressed to find a scouting service that talks about the spinning ability of every player. Everyone expects the ratings to be 100 percent correct, but they can't be. It's a feel thing. We strive for the biggest consensus." So do politicians. And in the manner of elected officials, Moore is open to lobbying. Well, sometimes. A few years back, he paid a visit to the Jacksonville Jaguars' training facility, where some players were working out. Word spread. The next thing Moore knew, he was talking to All-Pro receiver Jimmy Smith. Hey, this whole offseason I worked on speed and agility drills. I want to see my speed rating a little better. "We actually bumped him up a point out of courtesy," Moore says. "But there's a limit to that. "A guy like Byron Leftwich, one of our scouting reports said he was as fast as a manatee. If that's the perception, we don't want to make him that fast. He's not the quickest guy. He's an NFL quarterback because he has a cannon for an arm and he's accurate." Like Leftwich, Albright isn't in the league because of his fleet feet. Told that his speed rating is 22 points lower than Redskins punter Derrick Frost, he concedes that Moore got things right. Told that Frost's toughness rating is just six points lower than his -- 70 to 76 -- Albright arches an eyebrow. Told that long snapping isn't even a rated skill in "Madden," he slowly shakes his head. "I mean, if they rank Clinton Portis higher than me on spin moves, what am I going to say?" Albright says. "I can't do any better. But if you put him in there to snap a punt or field goal at the end of the game with a rush coming on, I bet he can't do what I do. "To have a really realistic game, you've got to add a little something in there for it." Therein lies the rub: botched snaps may be real, but botched snaps aren't fun. And in "Madden," fun remains the point. In making the game, EA Tiburon had a choice: a) add long snapping, and watch frustrated gamers hurl their controllers at the screen; or b) list Albright as a backup offensive lineman, a position he hasn't played since his second NFL season, when he was 10 years younger and 45 pounds heavier. "Most people watching games don't even notice the long snapper," Moore says. "And Albright's like 260 pounds. So we can't give him very good strength or blocking ratings. But if we ever add a snapping rating, he'll be one of the top guys." In the meantime, Albright is on the bottom. Not that he minds. Much. For the worst player in digital football, real life is pretty sweet. While his teammates sweat and collide during training camp drills, Albright hangs out with the kickers and punters, practicing snaps. His hands are too valuable to risk in a scrimmage. "What did they rate me last year?" Albright asks. A little lower, actually -- 50 overall. "Well, I'm a year older and they bumped me up," he says with a smile. "That's not all bad." Not bad at all. Then again, that's just the sort of agreeable thing you'd expect Albright to say. His "Madden" team morale rating is 100. A perfect score.